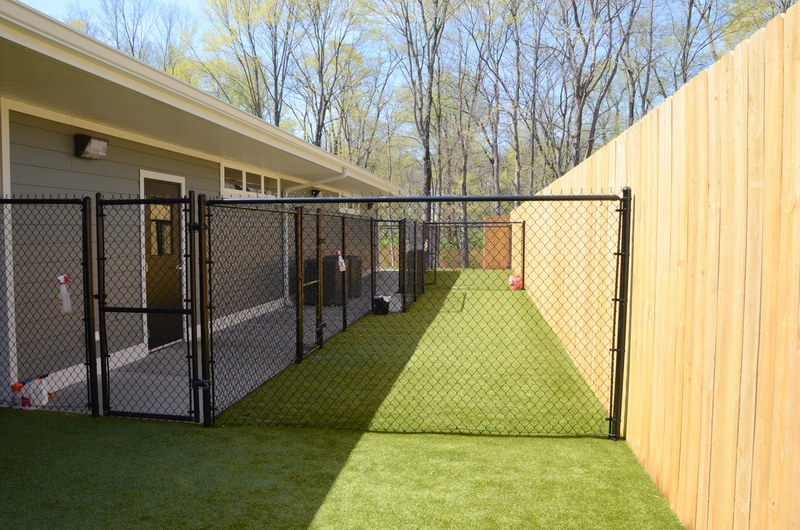 We want The Pet Station Country Club to be your dog’s home away from home. We’ve considered all the little details to ensure they have everything they need to be comfortable and satisfied throughout their stay. 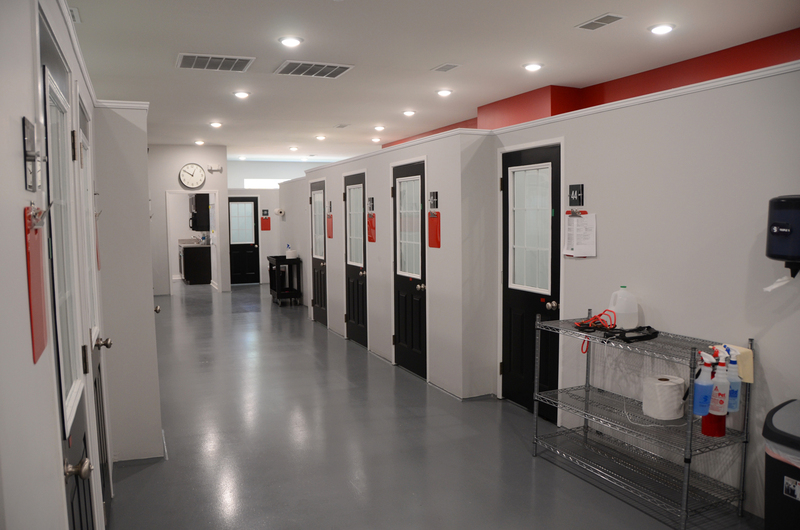 We are fully staffed 24 hours per day, 7 days per week, 365 days per year. 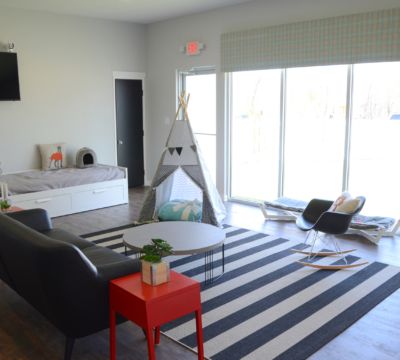 Look through our accommodations options below to find the right fit for your pet. 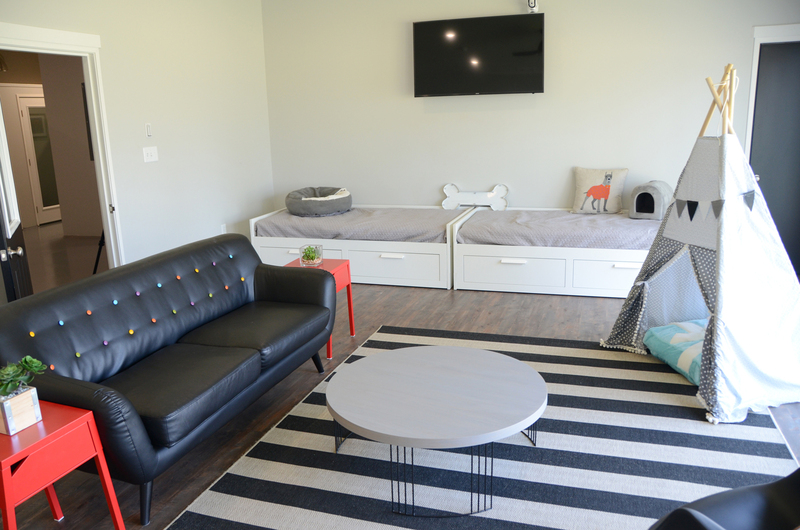 Specially created for dogs 16 inches and under at the shoulder and 30lbs or less, our Luxury Lounge is the epitome of luxury for your pet. 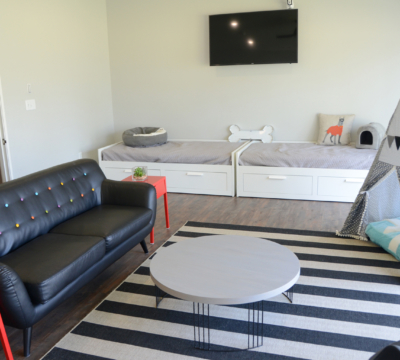 Complete with comfy couches and soft beds, and staff that spend the night in the room just like you would, your dog will feel right at home! 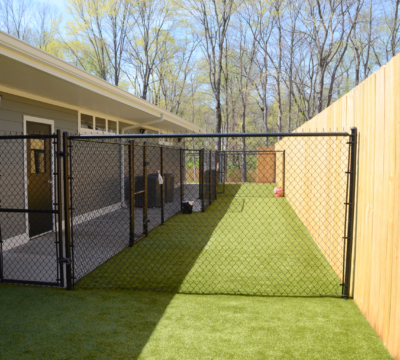 From the Luxury Lounge, your dog will also have full-time access to our beautiful fenced yard, lots of furry companions to hang out with and 24/7 supervision by our highly-trained staff. It doesn’t get much better than that. 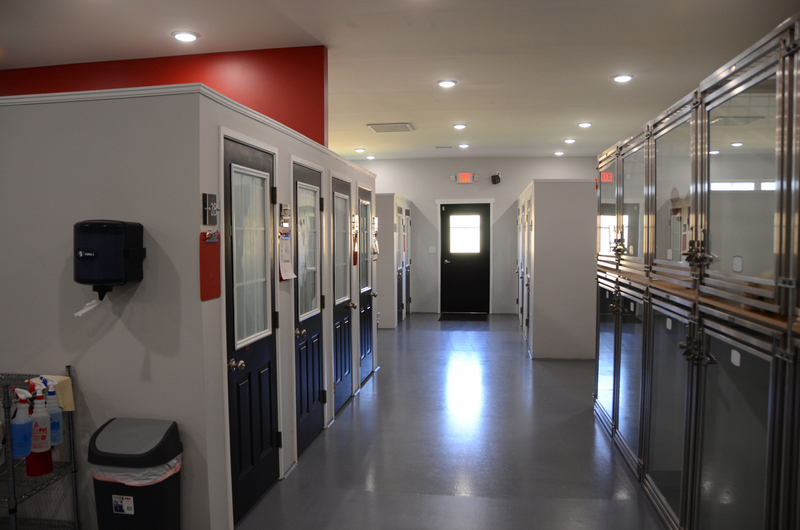 Upon your pups arrival to the lounge we will evaluate how they handle being with other members of our lounge pack. If it is not a good fit, we will notify you and move them to one of our Premium Suites or Private Residences. *All dogs 8 months of age and older must be spayed or neutered to participate in Lounge activities. Now, we know all the fun in the world won’t keep you from missing each other, which is why in addition to sending daily photos of your pet, we also offer PetChatz. PetChatz is the newest system in pet communication that allows you to see, hear and talk to your dog. Each Premium Suite is outfitted with PetChatz and you download the app right to your smartphone. Not only can you see and talk to your pet, you can even dispense a treat for them! PetChatz in Each Suite with DOGTV included! You won’t find any chain link here! 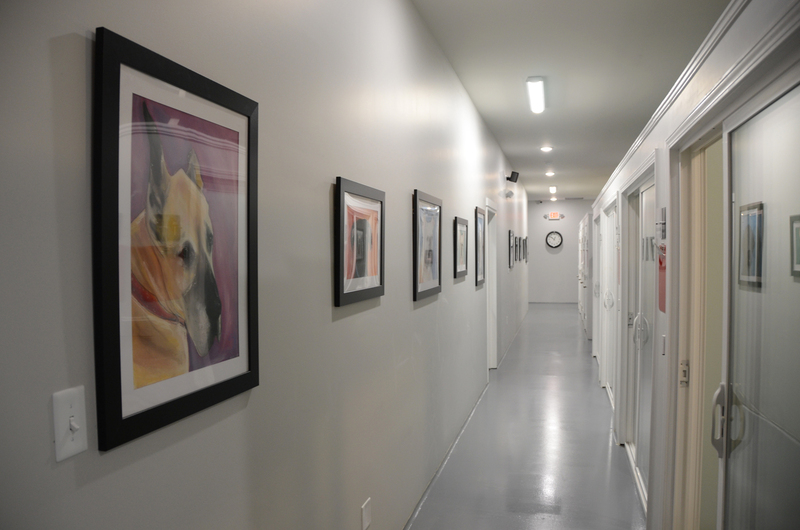 Our Private Residences are top-of-the-line individual rooms designed with your pet’s comfort in mind. 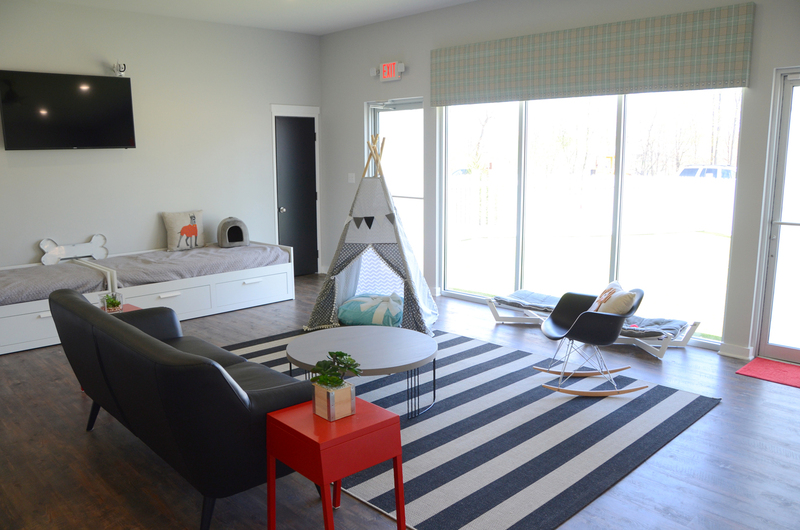 These rooms come with adjustable lighting to help set the mood, and put your pup at ease. 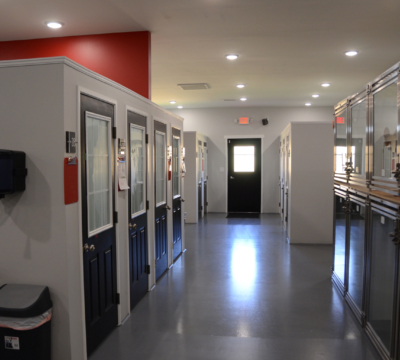 We consider your pet’s health to be of the utmost importance, which is why we have a state-of-the-art HVAC system to supply fresh, purified air. 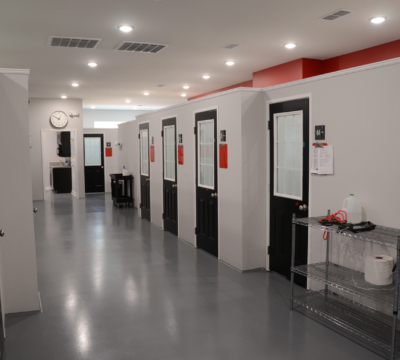 We also have 100’s of sound proofing boards to reduce noise and keep all our members calm and happy. *If you bring your own bedding for your pet, we’ll use it to keep them comfortable, and then we’ll wash it before sending it home with you. **We strive to get the best pictures of your pet in action daily, but cannot guarantee a daily photo during busy or holiday weeks. Please feel free to call and check-in anytime during their stay. 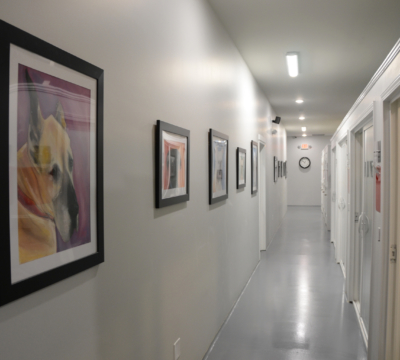 For multiple family members in the same room, receive a 20% discount for the 2nd and/or 3rd dog. Convinced these options will keep your pet’s tail wagging while you’re out of town? Get started here. Boarding check-in starts at 1 PM on weekdays. A $12 early drop off charge is applied to bill if checking in before 1 PM. Boarding check-out is before 12 PM on weekdays. A $6 per hour late charge (not to exceed $30) will be applied to your bill if your pet is not picked up by 12 PM. Check-in and check-out on weekends can be any time during business hours. All pets are given Capstar Flea Treatment Tablets at intake to prevent fleas from ruining their stay. A $4.50 charge per pet will appear on your final invoice. We ask that you provide individual pre-portioned bags of food for your pet’s daily meals to prevent disruption in their diet. If you are unable to pre-portion your pet’s food, we will provide a service to do so. A $.50 per bag charge will appear on your final invoice for this service. If no food is brought, we will provide your pet with our house food, Acana, and a $2 charge per meal will appear on your final invoice. At The Country Club, we believe in upholding a culture of respect for our guests and members. We kindly ask for respect in return in regards to reservations. Under normal circumstances, a reservation for a dog requires a deposit of $50 and for cats, the deposit is $30. We ask that you give us 72-hour notice of cancellation or 30 day notice for holiday times so that we can refund your deposit. Notice received less than 72-hours before the day of arrival results in the deposit converting to a credit on your account to be used on a future service at The Country Club.